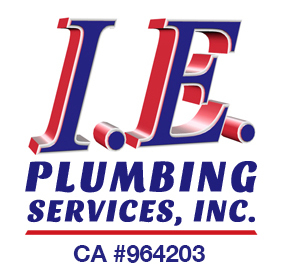 Plumbing Services Hemet, California | IE Plumbing Services Inc. 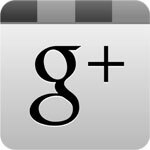 Need A Professional Plumber In Hemet? Frustrated by a liquid drain cleaner not working? Or has your routine been disrupted by clogged drain, a slab leak, or water heater problem? 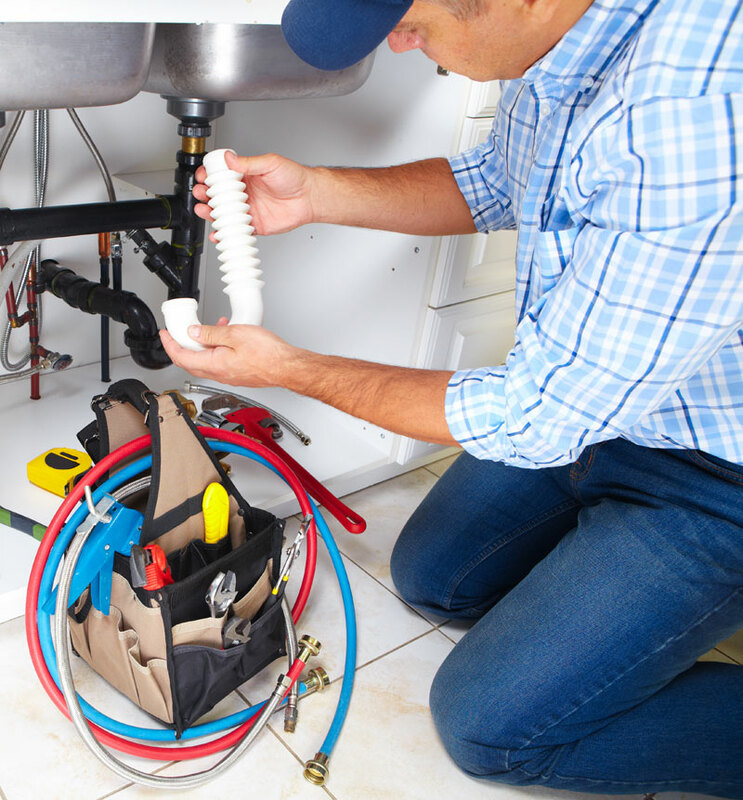 We provide Hemet, California homes and businesses with economical emergency residential and commercial plumbing services 24 hours a day 7 days a week, including weekends and holidays. We’re a full-service plumbing contractor, so whatever you need we have you covered. We’re known in and around Hemet for our outstanding sewer cleaning and drain cleaning services, fast repairs and replacements for water heaters, expert leak detection, and repairing slab leaks. We can even be your remodeling plumber for repipeing and new water, drain, sewer, and gas lines. 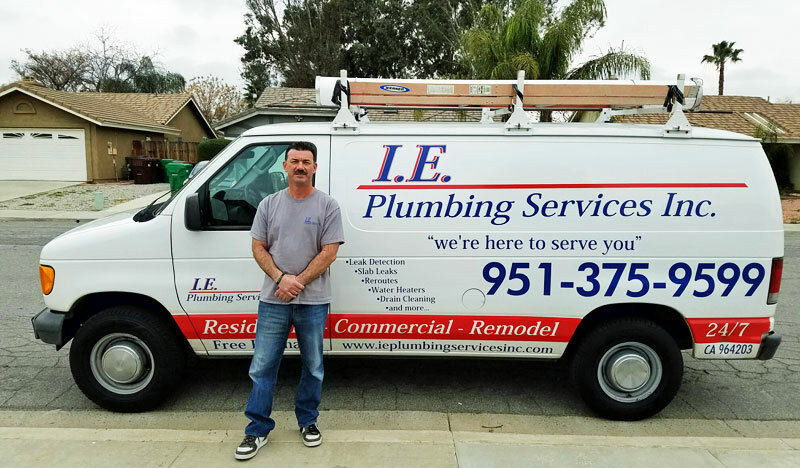 We Are I. E. Plumbing Services Inc.
Our commercial and residential plumbers have been serving Hemet and the Inland Empire for over 16 years, delivering quality workmanship at competitive rates. Family owned and operated we’re a licensed California plumbing contractor, insured and bonded. Our field and customer service staff work to earn your business because want to become your local plumber for years to come. We’ll discuss our plan of action and present a detailed written estimate for your approval. Whatever your plumbing problem you can count on our expert trouble shooters for quick, dependable diagnosis. In addition to the plumbing services highlighted below we can take care of toilet repairs as well as installing, maintaining, and repairing water softeners and reverse osmosis filters. And much more. Our teams have all the training, experience, and equipment necessary for outstanding commercial plumbing services at economical rates. Besides the plumbing itself, we understand the documentation, invoicing, and procedural needs of business properties. Our nearly two-decade track record includes working with HOAs as well as property management companies for apartment and office complexes. Slow draining sinks gradually worsen and at some point completely stop, leaving you with a back-up at what often seems like the worst possible time. Even more annoying are those kitchen sink clogs that keep coming back. That’s why when appropriate we can go way beyond the usual cabling (drain snaking). We’ve invested over $45,000 in the latest hydro jetting equipment. It generates high-pressure jets of water to scour away grease and grime build up, cut through obstructions, and flush out everything for pipes that are as clean inside as they were when brand new. That’s drain cleaning that lasts. With a 500 foot hose and advanced rotary nozzles there’s not much we can’t do. All your drains as well as your toilets hook up to a single sewer line that connects to the Hemet sewer system at the street. Grease and sludge, tree roots, flushed objects, and other obstructions there can affect just about any toilet, sink, tub, or shower. Or your clothes washer. We’ll begin our sewer cleaning service with an in-pipe video inspection to understand exactly what the problem is and where it’s located. We can then proceed with cabling, an auger, or hydro jetting and get the job done right the first time. If that video inspection reveals a heavily corroded or otherwise damaged sewer line we’ll advise you on your repair and replacement options and can proceed with those if you choose. Our water heater specialists have diagnostic skills that save time and money. That’s especially important for gas water heaters with their more complex system of burner, pilot light, and safety devices. With our well-stocked trucked we typically complete a water heater repair in a single visit of just an hour or so, and can often provide same-day water heater installations. We’re also experts in the installation, maintenance, and repair of instant / tankless water heaters as well as the latest high-performance technologies. 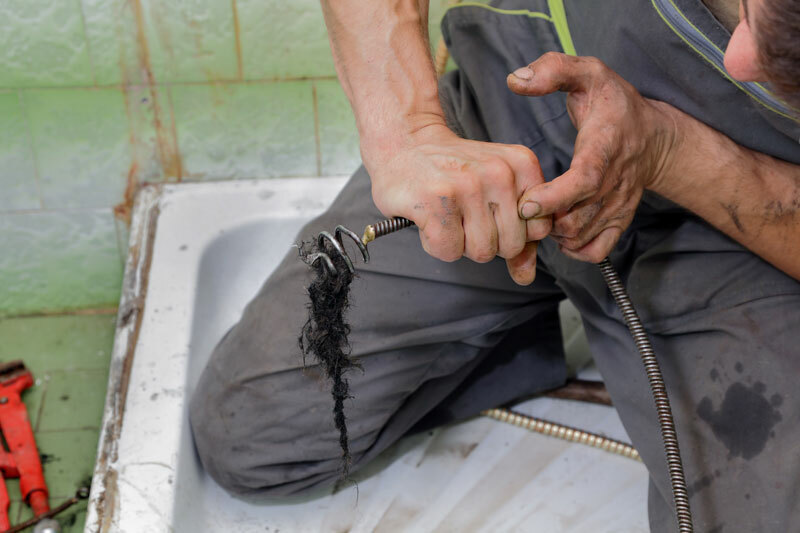 Your plumber will be happy to go over their benefits and cost trade-offs with you if you decide it’s time for a replacement. Some water leaks are obvious, but some can remain hidden inside walls and under floors for weeks or months before the water damage they cause becomes obvious… and potentially very expensive. So if you notice damp or warm areas, an unexplained increase in usage on your water bill, or low water pressure it’s worthwhile to call in one of our leak detection specialists. It’s been known for decades that experience and training alone are not enough, often leading to breaking open unnecessary holes. 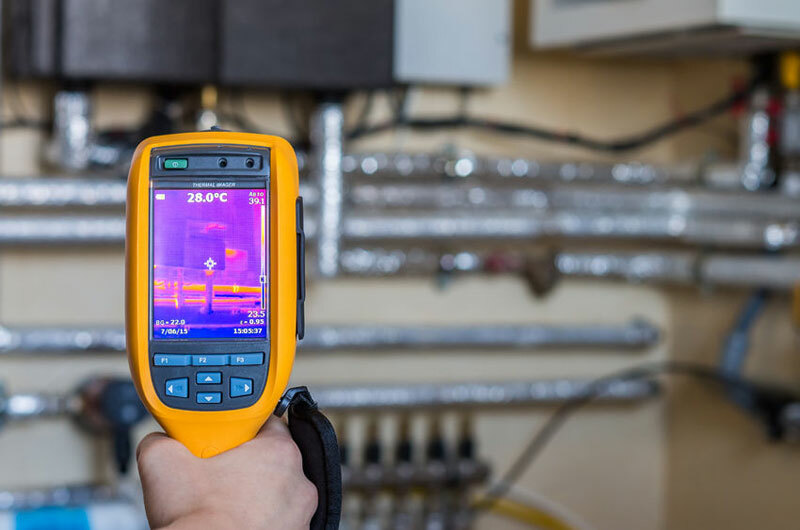 That’s why we use state of the art gear such as electronic leak detection instruments, thermal imaging, and ultrasound equipment. Whether in a gas, water, or sewer line we’ll track it down and then complete a permanent leak repair. Most of the recently built homes and commercial construction in Hemet use a concrete slab on grade (top of the ground) as the foundation. Water, sewage, and gas leaks occurring in pipes running under that concrete slab are called slab leaks. They can be caused by a shifting foundation, roots from a tree too close to the building, poor installation, and simple aging (particularly common in certain types of older pipes). With our leak detection experts we’ll go straight to the problem for a minimum of disruption. Depending on the location as well as the type and condition of the plumbing, your slab leak repair options include a spot repair of just the leaking section or a reroute of new pipe outside the edge of the slab. We’ll take the time to discuss each with you, including which will be the lowest cost in the short- and long-term. The City of Hemit receives its water from five deep wells in the San Jacinto and Hemet groundwater basins as well as the Eastern Municipal Water District. That’s sometimes supplemented from the Lake Hemet Municipal Water District. Carefully and continuously monitored, after treatment there have been no violations of established health standards (http://www.cityofhemet.org/DocumentCenter/View/4495). But those wells mean that on average city water rates as “very hard” with around 260 ppm (parts per million) of naturally occurring calcium and magnesium. That’s not a health issue, but it does cause problems with scale build up in plumbing and appliances and interferes with many hair-care products. IE Plumbing can install a whole-house water softener to remove those minerals, greatly extending the lifetime of appliances such as water heaters. We can also install under-the-counter reverse osmosis and other types of water filters for the best tasting coffee and tea plus a bit of added safety. Excellent Service from I.E. Plumbing Services - I have rental properties in Murrieta. One of my renters called panicked about an overflowing toilet. I Googled "Murrieta plumber discount coupons". EMailed the coupon page to my renter, they called the number and 45 minutes later, problem solved. Fast efficient and I saved money.